Zimbabwean opposition official and former finance minister Tendai Biti has urged President Cyril Ramaphosa to intervene in the country's economic and political crisis, which has left three people dead. This is more than three times the price of petrol in SA. The fuel hike gave Zimbabwe, one of the poorest countries in the world, the dubious honour of having the highest fuel prices in the world, heaping more misery on a population struggling with a shortage of foreign exchange that has seen the country run short of basics such as bread. Zimbabwe's information minister Monica Mutsvangwa on Tuesday said the three people killed included a police officer. "I don't know how many dead bod-ies Sadc wants to see before they will move on what is clearly a crisis. The lives of African people matter, and they should matter to the Sadc. Mnangagwa was in Russia on Tuesday to meet President Vladimir Putin and told stateowned RIA Novosti news agency that he would ask for loans from Russia. "The bottom line is that we are be-ing led by a rogue regime, following a sham election," Biti said. Ramaphosa "and his fellow Sadc member presidents must show leadership here." 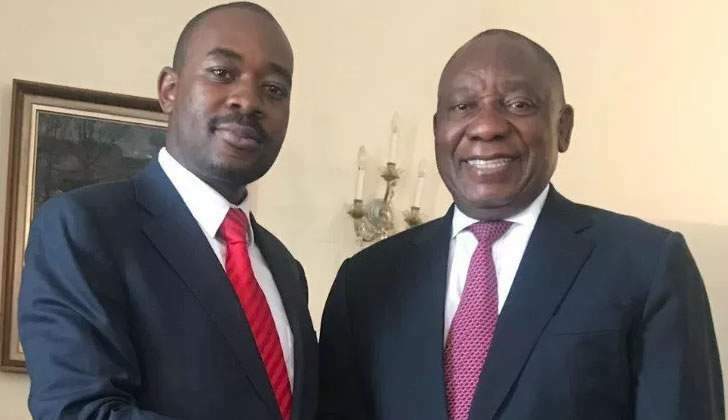 Ramaphosa met with Chamisa just over two weeks ago. The opposition leader said he had sought the SA leader's help in addressing Zimbabwe's economic crisis. Zimbabwe's mobile phone networks and internet were partially shut down, with one industry source saying the systems had been jammed, with many users com-plaining of limited access. Zimbabweans mainly rely on electronic payments as US dollar notes are in short supply. The local "bond note" currency, introduced in 2016, is little trusted and falling in value. "As we grapple with our own path forward, we could also do well to reflect on the situation in Zimbabwe right now. They too were asked to believe that a new leader [Emmer-son Mnangagwa] of a failed liberation movement [Zanu—PF] would steer them towards a different out-come. And now they are discovering that a government runs on systems and not individuals. If those systems are broken, it doesn't matter who is in charge."